Address: 53 George Street, Hadleigh. William Mulley's story is one of a double family tragedy. Sadly he and his younger brother Albert, were both killed in action within a few weeks of each other. Albert's story is also told on this website. William was born in Hadleigh in 1882. 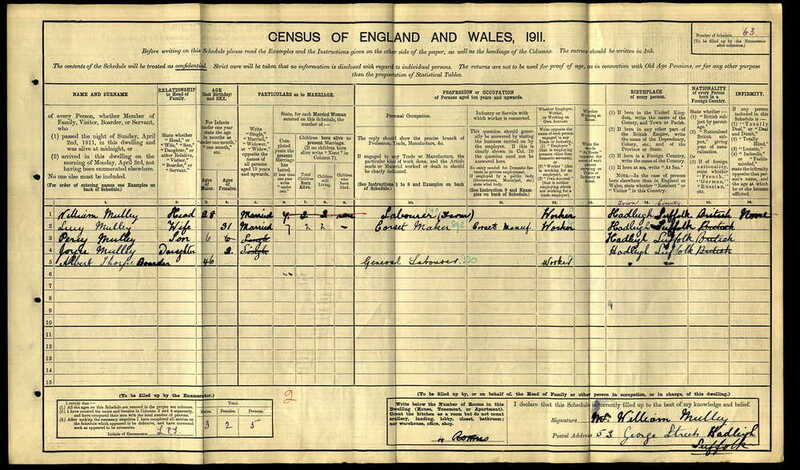 The 1901 census has him living at home at Place Farm with his parents; Arthur and Eliza Mulley and his siblings; Herbert (16), Albert (14), Frederick (12), Eva (10), Lily (9), Ive (6), Harry (4) and Edwin (2). 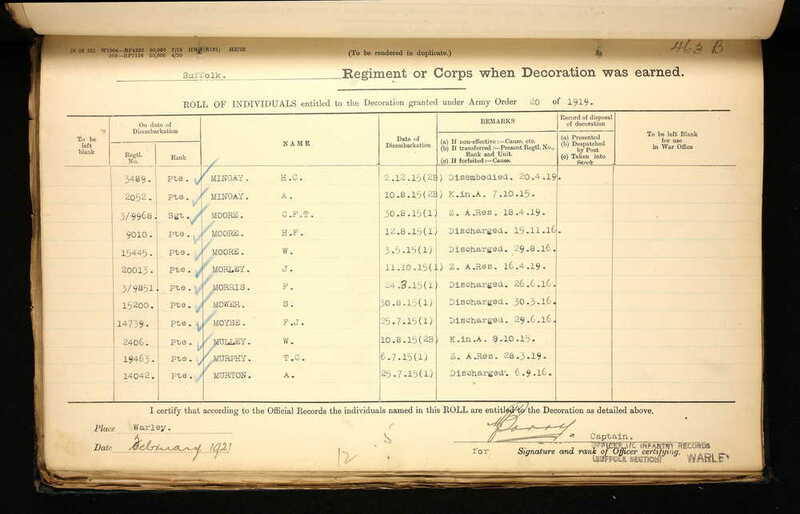 We are not exactly sure when William enlisted, but going by his regimental number we believe it was between September and October 1914. During this period, around 400 men enlisted in response to the outbreak of the war. We know that the local territorial unit, the 1/5th Suffolks were mobilised on the night of the 4/5 August. 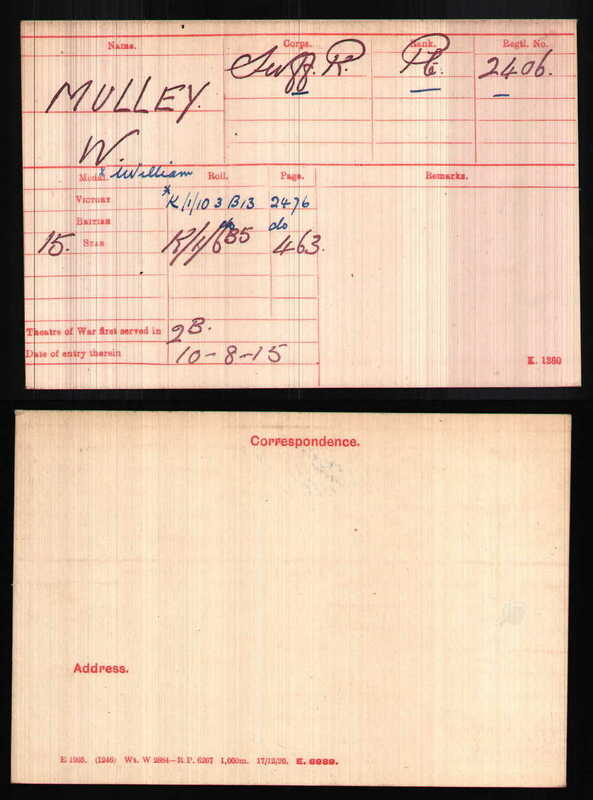 The whereabouts of Wiiliam's medals is currently unknown, however his medal index card states that he was entitled to the above three medals. On that day, at least 16 men from Hadleigh were killed. Due to the nature of the fighting, their bodies were never recovered from the battlefield until the early 1920s. By then the remains were unrecognisable and could not be identified. 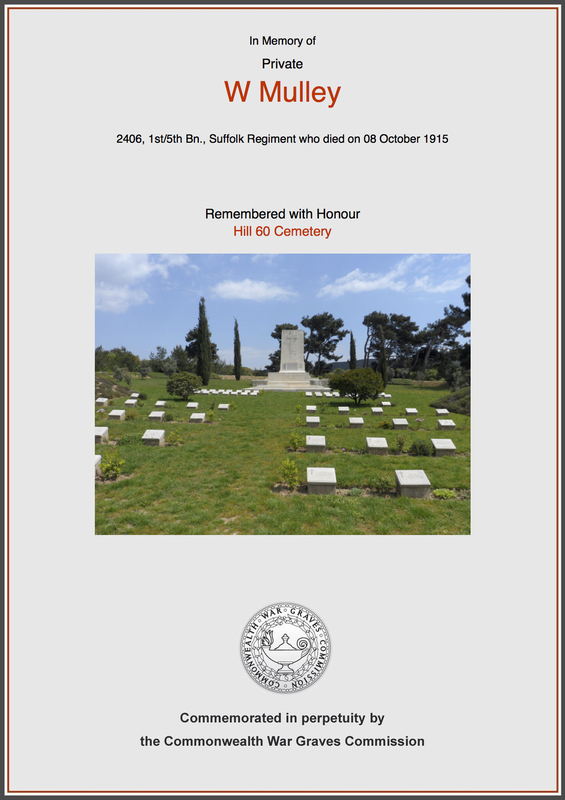 The remains were most likely buried in Azmak Commonwealth War Grave Commission cemetery in an unmarked grave. This cemetery is in the area were the Suffolks held the front line. 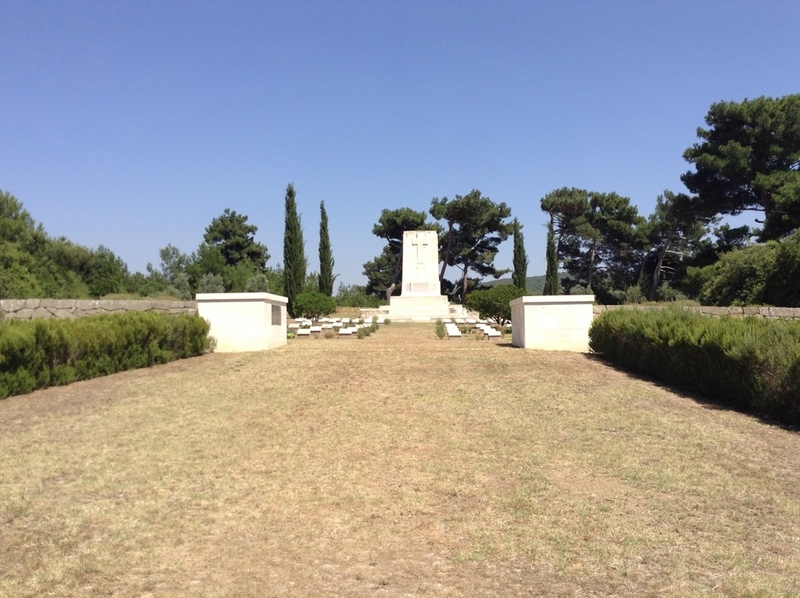 Their names are commemorated on the impressive Helles Memorial which stands on the southern tip of the Gallipoli peninsular. We believe that William took part in this battle and survived. Sketched trench map showing the trenches around Hill 60. William's was originally buried near to 'Norfolk Street' trenches, close to were he was killed. After the war the Commonwealth War Graves Commission constructed Hill 60 Cemetery and the 42 graves from the 'Norfolk Street' site were re-located into the new cemetery. William now lies in the corner of this very peaceful and remote cemetery. After the tragic events of mid August, the 1/5th Suffolks had been moved 4 miles to the south and by September they were in ‘Norfolk Street’ trenches on Hill 60. 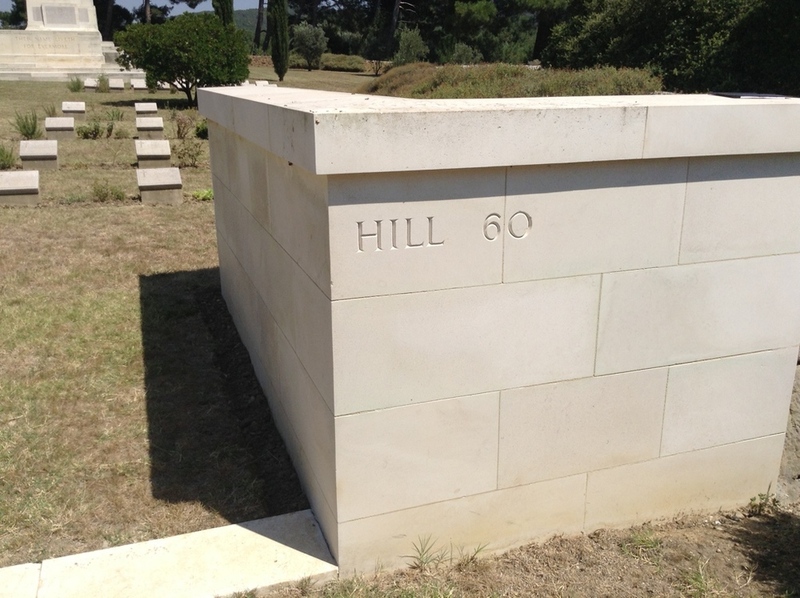 This was a key piece of ground on the rising slopes and was critical to the Allies as it overlooked the Australians and New Zealanders in Anzac Cove. The Suffolks were now severely depleted, at one point down to a quarter of their original strength. They had to endure horrendous conditions with flies during the heat of the day, vermin at night and water that was not fit to drink. Dysentery and diarrhoea were rampant and shell fire continued day and night. There was slight improvement by mid October as the weather began to cool. 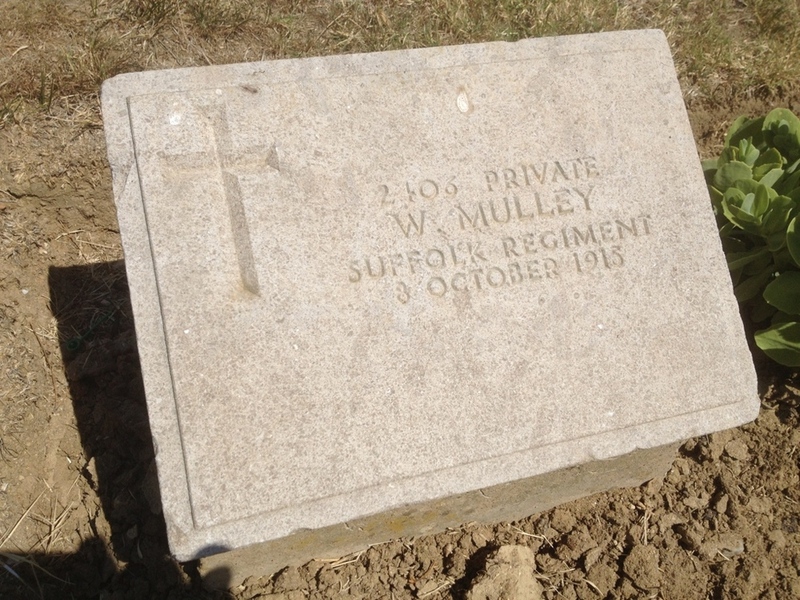 It was here on 8 October that Private William Mulley of Hadleigh lost his life. After the war the Commonwealth War Graves Commission constructed Hill 60 Cemetery and the 42 graves from the 'Norfolk Street' site were re-located into the new cemetery. William now lies in the corner of this very peaceful and remote cemetery. 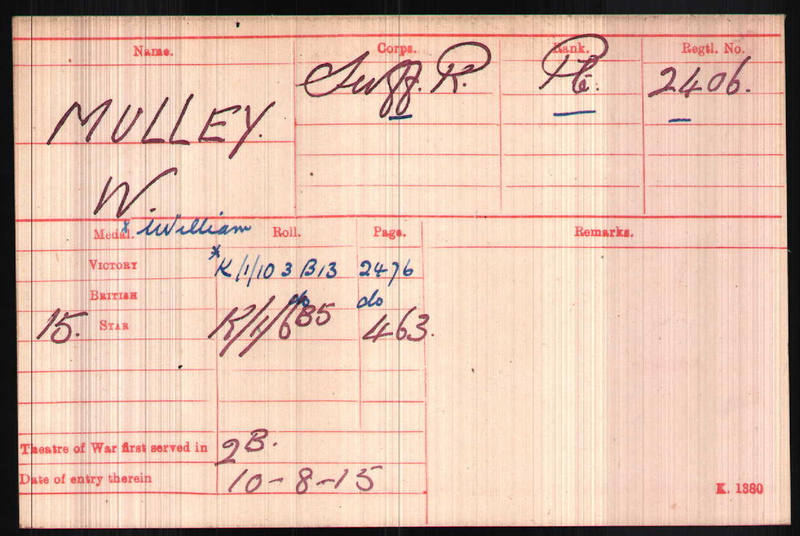 We hope that this page has been able to tell the story of William Mulley. If you know of any information which might help to add to the story then please get in touch.